Finding new ways to eat a pork pie is something we take seriously over here at the Vale of Mowbray. Recently, we've really been enjoying a pork pie with a Californian twist - with all this snow and poor weather here in Yorkshire, we're needing the thought of sun to keep our spirits high. Roll on Summer! This recipe is ideal for sharing this Easter - especially since you can keep it ready in the fridge and serve whenever your guests arrive. For this recipe, you’ll need your favourite Vale of Mowbray Pork pie – we’d suggest a medium pork pie for each person. First, we’re going to prep all the ingredients; it’s easier to do this all at once so chop the butternut squash into small chunks, cut the broccoli into small chunks, pick the leaves of the coriander and mint and chop them. Chop the pistachios, de-stone the avocado and zest and juice the lemon. Now we’re ready to begin! Pop the oven on to heat up to 180°C and prep your baking tray by lining it with parchment paper. Roast this for 20 minutes before shuffling it to one and adding in the broccoli – drizzle with another 1tsp of oil and season and roast for 10 more minutes. Whilst this is roasting in the oven, you can take the time to make the dressing. This is super easy to do – just take all the ingredients for the dressing and add them to a food processor such as a Nutri Bullet. Add a tbsp of water to ensure it’s not too thick and a pinch of salt – add more water, just a few drops at a time until it’s a smooth and pour-able consistency. Open the quinoa and pour into a large bowl. Next we’re going to add all the good stuff; the herbs, spring onions, pomegranate seeds and chopped pistachios. Now, pour in 1tbsp oil, season and then toss it together so that it all is evenly distributed. Drizzle the dressing on top and add the sliced avocado. Squeeze the lemon juice over the top to add a kick and then serve with a yummy Vale of Mowbray pork pie! So there you go; our Californian Pork Pie recipe; ideal for Easter weekend guests! A really easy recipe, it’s all in the preparation of this slicing all the ingredients but once all put together with a lovely dressing, it’s a Californian Summer twist on the humble pork pie! We’d recommend doubling the recipe and popping it in a Tupperware for the next day so you can enjoy it for lunch too – with no more effort you have a lunchtime treat which for us is always amazing whilst having a long day at work! 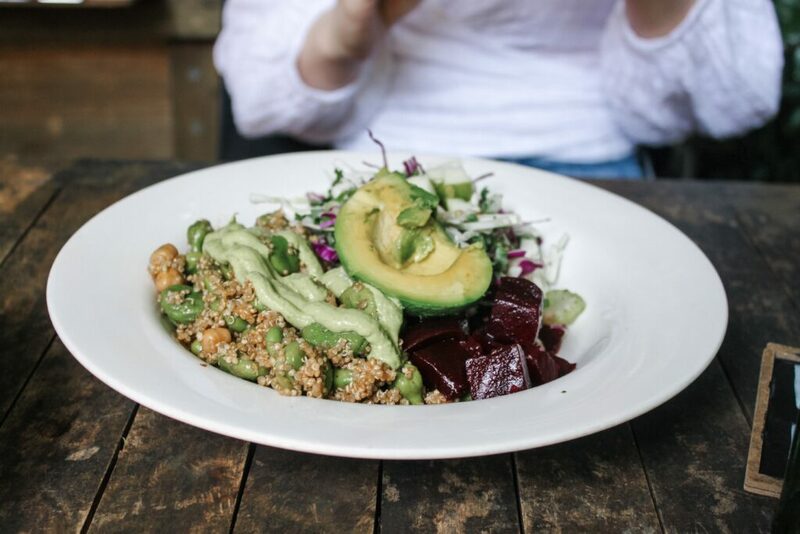 One of our favourite things about this recipe, as well as tasting slightly of sunshine is that it’s so customisable and you can add in different veggies and even fruits depending on how you’re feeling or what you like! Try adding in more pistachios or pomegranate seeds – add in some mango or green apple chunks for a more summery taste explosion! If you try this recipe, make sure to let us know on social media how you like your pork pie and quinoa!